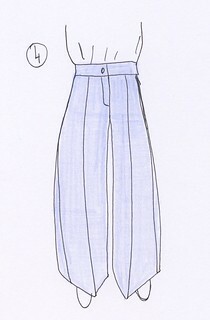 Here is the second part of the “Fitting trousers” series started more than a week ago. In the first part, I focused on corrections brought on the back of the pants, in this second part I will talk about the problems that can appear on the front of the pants. 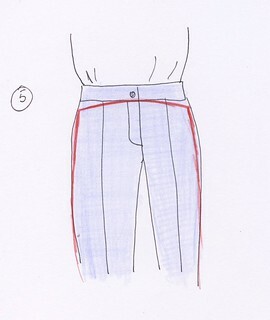 If your pants are already sewn, you need to undo the belt seam and to add fullness to the side seam at the hips. You also need to lower the belt seam with 0.5 – 1 cm at the center front and center back and raise it at the side seams (Figure 2). 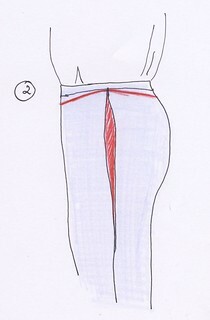 By doing that, your pants might become too tight in the crotch, so you might need to lower the middle seam with 0.5 -1 cm. A bit complicated, huh? I grant you, this is why I prefer test pants. 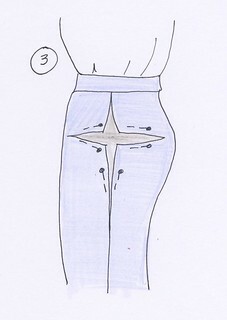 Cut your test pants 10 cm below the waist. Your cut should end 10 cm before the mid back and mid front seams. Undo the side seams a few inches and spread the edges of the cut until the ironed crease is straight. Pin the slot edges on additional fabric strips (Figure 3). The ironed crease turns inward (Figure 4). You need to remove some fullness from the hips. You need to carry out the same changes as previously described, but the other way round. It’s simpler. 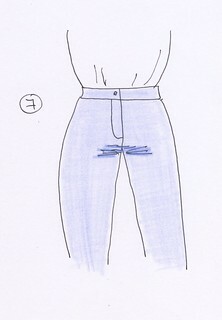 On your pants already sewn, undo the belt seam and remove the excess fabric at the hips. 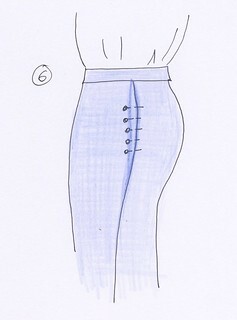 You will probably need to raise the belt seam in the mid front and mid back and lower it at the side seams (Figure 5). On your test pants, normally you didn’t sew the belt, yay, so you only need to reduce the excess fabric at the hips. 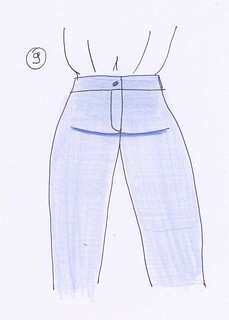 I told you that test pants are the best solution for the first try (Figure 6). Wrinkles appear under the fly front (Figure 7). The problem comes from the mid front seam. You need to release this seam, to uncurve it (Figure 8). Proceed by small adjustments as 0.5 cm may be too much. 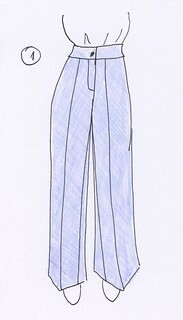 Pants are hanging in the front (Figure 9). You have a flat belly (congratulations!) or your posture is slightly leaning forward (correct your posture, get off your 20 cm heels or visit a Posturologist). In any case, you need to shorten the front of the pants. On your already sewn pants or your test pants, pin the excess fabric under the belt seam, form a pleat that is diminishing until the side seams and lower the belt seam. (Figure 10). You still have adjustment problems with your pants? The third part of this series will probably bring you the answer. 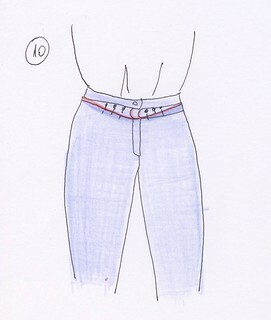 in figure 10 how do you move the zipper for already sewn pants? 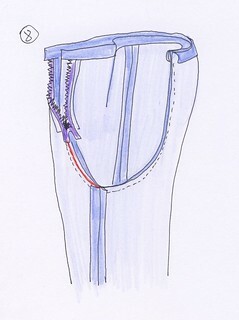 for the pants that is already sewn with a zipper i would shorten the zipper by cutting at the top.